Kelantan, the "Land of Lighting"
Kelantan is also translated as the "Land of Lightning" and is located at the northeast of Peninsular Malaysia with Thailand at the north, Perak to the west, Terengganu to the south-east and Pahang to the south. This state is a Malay heartland governed by PAS (Islamic Party) with the capital Kota Bharu the main city of the state. The main economy of the state is agriculture with paddy fields and fishing villages a common sight as you travel from one town to another. The peoples are mostly simple folks and friendly in nature. This laid-back lifestyle has attracted many visitors to this state, away from the rush of city life. Stong State Park at Kuala Krai is one of the most popular destination if you are into jungle trekking, mountaineering or enjoying the flora and fauna of the tropical rain forest. You can scale Gunung Stong and stay overnight at Baha Camp. The Jelawang Waterfalls is a seven-tiered waterfall coming down from 303 m and is reputed to be the highest in Southeast Asia. 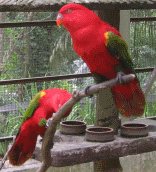 Kuala Woh National Park at Gua Musang is the northern entry point to Taman Negara. This less travelled route is for the adventurous and some of the nature activities you can do here are kayaking, canopy walk, river rafting, jungle trekking, bird watching and fishing. There are over 200 species of birds that have been spotted here. Try caving at Gua Ikan and Gua Gelap at Dabong. Gua Ikan is named so due to its shape in the form of a fish. Similarly Gua Gelap is named so as the surrounding is dark with limited light coming into the cave. Other caves at Gua Musang district are Gua Sidang, Gua Pintu and Gua Cha. Gua Cha is the place where archaelogical activities have found early civilizations with the findings of human skeletons and cultural objects. There isn't any island in Kelantan but there are nice beaches near the state capital. It is advisable not to swim at these beaches during the monsoon season from November to March as the sea will be rough during this time. Pantai Cahaya Bulan was previously known as Beach of Passionate Love. There are beautiful coconut and casuarina trees along this beach. Chalets are available for bookings. Pantai Irama or Melody Beach is about 30km away from Kota Bharu and is said to be one of the most beautiful beaches at the east coast. 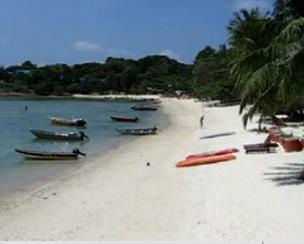 Pantai Seri Tujuh or Seven Lagoons Beach is near Tumpat and only 5km away from the Thai border. It has the longest lagoon in Malaysia. The annual International Kite Festival is held here. Most of the visitors here are locals who come here for picnics. Pantai Tok Bali in Pasir Puteh is about 50 minutes drive away from Kota Bharu and the jetty here is one of the staging points to Perhentian Island. There are chalets and beach resorts that you can stay while enjoying the tranquility of the beaches here. Pantai Kuala Pa'amat at Sering is about 12km away from Kota Bharu and was the first location where the Japanese landed in Malaysia on 8 Dec 1941 at 12:25am during the WWII. The Cultural Centre or Gelanggang Seni in Kota Bharu is the place to go to find out more about the folk arts and traditional performances of Kelantan. You will experience the Wayang Kulit or shadow puppetry, the silat or Malay martial arts, watch how the folks play with the gasing or spinning top, see how the wau of giant kite is flown. Try also the Rebana Ubi, a big drum that has been a part of the traditional musical instruments for decades. Admission to the centre is free. Performances are shown on Sunday, Monday, Tuesday, Wednesday and Saturday from 3:30pm. While at the state capital, you may want to visit The State Museum,Royal Museum, Museum of Royal Traditions and Customs, Craft Museum and War Museum. Take note that these museums are closed on Fridays. Siti Khadijah Market in Kota Bharu is the most visited bazaar shopping in the state. All types of food stuff such as fruits, vegetables, spices, desserts and other goodies can be obtained here at a reasonable price. Rantau Panjang and Pengkalan Kubur near the border of Thailand offer many products from Thailand. There are also duty-free shops here. Jalan Temenggong is a stretch of street that sells everything from Kelantan. Goods include brassware, wood carvings, textiles, clothes and jewelleries. Bazaar Buluh Kubu is another good shopping location. You will need to bargain here if you are keen to purchase any of the products. Goods from Thailand are also sold here. There are not that many hotels in Kota Bharu compared to other major cities of Malaysia. Hotel Perdana Kota Bharu is one of the better ones around. No-frills Tune Hotel is also located at the city centre. Check out the hotel rates here.